According to reports, a white Land Rover Range Rover worth about $145,000 appeared to be vandalized by a woman who was cheated on by her significant other. The Range Rover was reportedly parked outside of Harrods, London's most popular department store. As you can see in the above photo, the word "CHEATER" is quite clearly graffitied on the side of the six-figure Range Rover, and the hood of the car appears to say, "HOPE SHE WAS WORTH IT!" In case this accused cheater couldn't figure it out, the scorned lover also wants the cheater to know "ITS OVER." Yeah, something tells me the cheater probably knew that after taking one look at what used to be a very clean ride. Thanks to another photo taken by a passerby, it appears the woman wrote something on the back window of the Range Rover, too, but I can't quite make out what was written. 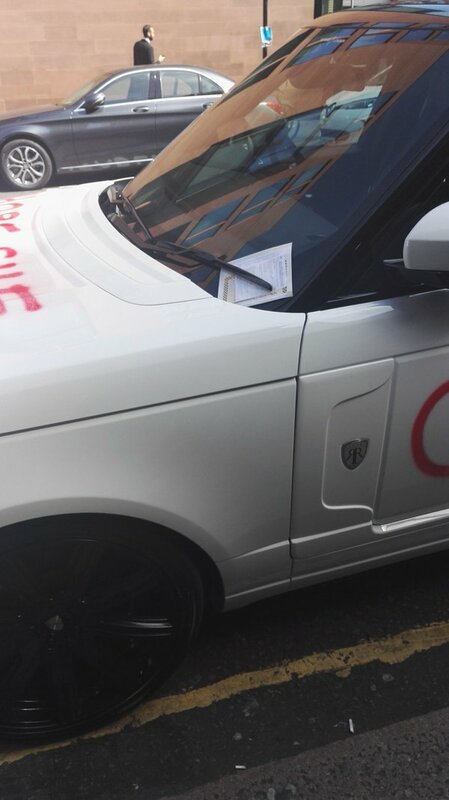 If this day wasn't already sh*tty enough for the owner of this $145,000 Range Rover, it looks like the accused cheater got a parking ticket on top of everything. Let this be a lesson to all the would-be cheaters out there. You may want to ride around in a friend's car or just take public transportation for a while if you've been cheating on your significant other and think there's even the slightest chance he or she knows or could soon find out. Or, just don't cheat on your loved ones. Yeah, that's probably the bigger overall takeaway here. If you're unhappy in your relationship, break up. It's not the Range Rover's fault this person got caught cheating, but the car is paying the price. Editor's note: Sources report a woman vandalized the vehicle, but the gender of the owner of the vehicle could not be independently confirmed as a man.